This is one of the more common of the tropical/subtropical Xylaria that one is likely to encounter, and represents the typical form for a large species complex that includes many similar taxa, largely distinguished from one another by microscopic characteristics of the ascospores. I’d like to spend some time considering this taxon, the history of its taxonomy, and the larger group of which it is a part. Members of the “Xylaria apiculata group” will typically have delicate stromata with a distinctly pointed (acute!) sterile apex (sterile, meaning that there are no perithecia) and an ectostromal layer, generally remaining well into maturity, which has been split into vertical striations by the expansion of the perithecia. The stromata of this fungus are slender and relatively tall compared to the other species in the complex, ranging from about 0.5 cm to 3-4 cm tall by 1-3 mm wide. The fertile (peritheciate) portion ranges from about 0.3- 1.5 cm, and begins and ends abruptly. The perithecial contours are just visible beneath the surface, and there is a pale coating on the outer surface that is split into vertical striations or scales by the perithecia developing underneath. The interior tissues are white, and softer than the black outer coating; the stipes are often (but not always) densely tomentose. Mature stromata are not often branched, though they may be; non-peritheciate (conidial/anamorphic) stromata may be highly branched, or not branched at all. (Remember: Xylaria species are nearly always impossible to identify from non-peritheciate, conidial stromata). The perithecia are globose, 0.3-0.6 mm diam. The ostioles are very finely papillate. The asci are monoserrate, with stipes shorter than spore-bearing parts, tipped with a I+ (reactive in Melzer’s reagent) apical apparatus 3-4.5 µm tall by 3-4 µm broad, inverted-hat shaped (flaring at the outer rim), sometimes with a swelling in the center as well. The ascospores are brown to olivaceous-brown, unicellular, ellipsoid-inequilateral (like a flattened football) to navicular, with narrowly to broadly rounded ends. They measure 20-28 × 7-12 µm (length:width ration is usually between 2.2 and 2.8), with straight, spore-length (or nearly so) germ slit on the flattened (less curved) side of the spore. 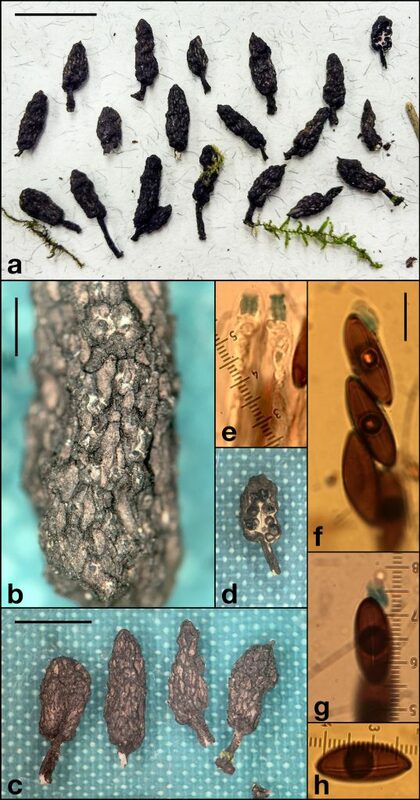 Part of the large Xylaria arbuscula species complex (also called the Xylaria apiculata group), this taxon is distinguished by its larger ascospores and spore-length germ slit. These are the commonly encountered species that might be confused for this taxon: X. pseudoapiculata, X. venosula, X. arbuscula, X. xylarioides (= X. schreuderiana), X. pseudoapiculata, and X. smilacicola. They are distinguished mostly by ascospore characteristics — ascospore length, germ slit morphology, and other distinguishing characters are given below to help separate these similar taxa. Cooke, M.C. 1879. New Zealand fungi. Grevillea. 8(46):54-68. Folks were a bit more laconic about describing new species back then; the purpose of the publication was mostly just to point people to the type specimen (which has since been transferred to Kew, along with most of the rest of Cooke’s herbarium). Something to keep in mind when you encounter these fungi. Unfortunately, there still isn’t really enough genetic evidence to sort these taxa effectively. There is a need for increased collection, and the preservation of high-quality DNA extractions — something that is complicated by the fact that these fungi are often collected in remote regions of developing countries. ” Xylaria apiculata Cooke (Figs. 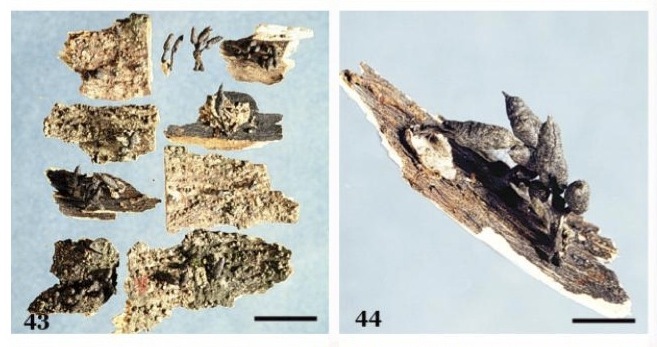 43 and 44) Notes: This small fungus is probably a member of the complex that includes X. arbuscula, X. bambusicola and X. partita; these taxa are discussed elsewhere herein. They are separated primarily on ascospore size and, in the case of X. bambusicola, on host. “Distribution: HA: Kipuka Puaulu; OA: Castle Tr. From Rogers & Ju 2012. Fig. 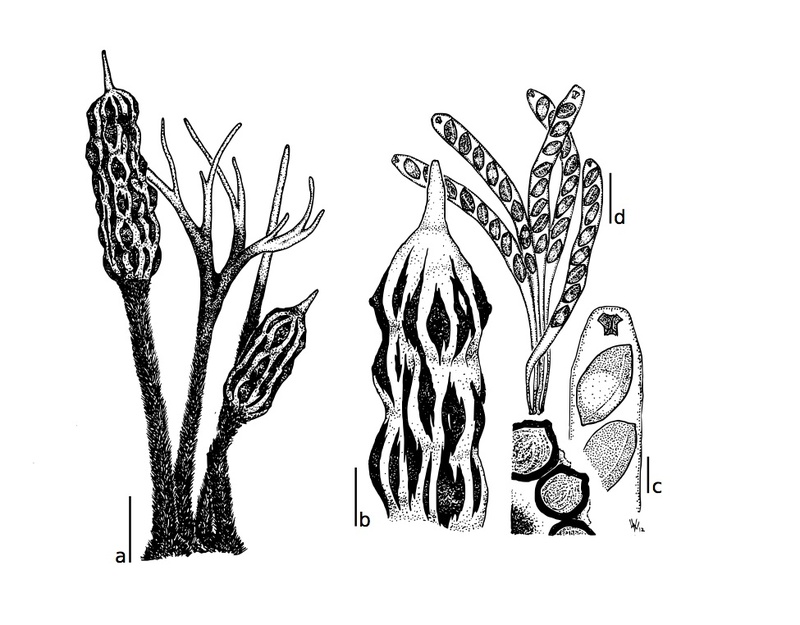 8 Xylaria apiculata A, B, C, Stromata (A: PDD 41970, B: PDD 43161, PDD 43171). D, Anamorphic stromata (PDD 44427). E, Stromal surface (PDD 41968). F, Hairs at base of stroma (PDD 41968). G, Ascal ring (Melzer’s reagent, PDD 41970). H, Ascospores with germ slits (Melzer’s reagent, PDD 41968). I, Culture on OA (PDD 45352) (Lines A, B, C, D = 1 cm; G, H = 10 µm). (From: Rogers & Samuels 1989. 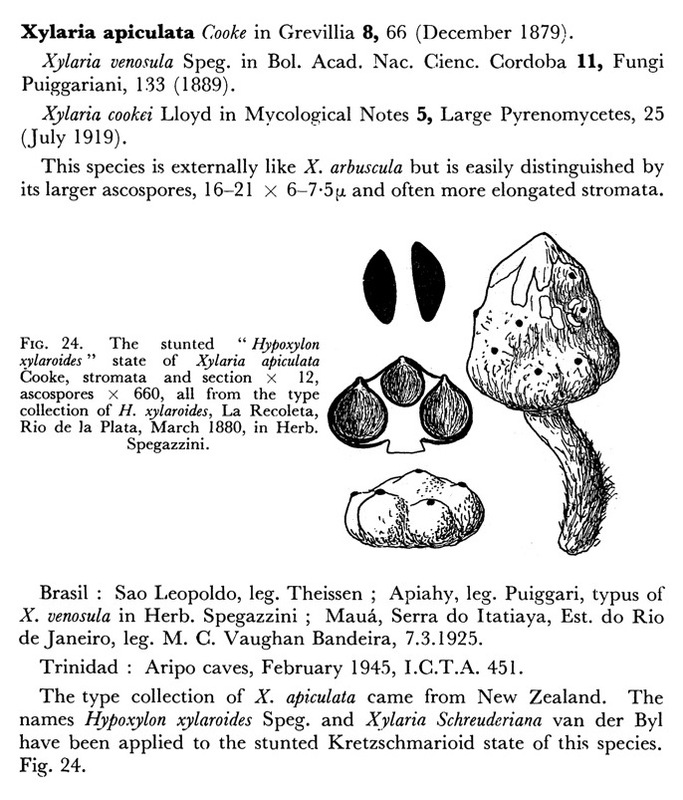 )It’s a little grainy, and the black-and-white that was necessary due to the printing technology available at the time is limiting, but overall, I think this is the best illustration of this taxon in the current scientific literature on Xylaria. Hopefully, if you find a pointy-tipped Xylaria, now you’ve got some tools to help you determine if it’s Xylaria apiculata, or one of the many other taxa in this fascinating group of fungi. Cooke, M. C. (1879). New Zealand fungi. Grevillea, 8(46), 54-68. Dennis, R. W. G. (1956). Some Xylarias of tropical America. Kew Bulletin, 401-444. Dennis, R. W. G. (1957). Further notes on tropical American Xylariaceae. Kew Bulletin, 297-332. Hladki, A. I., & Romero, A. I. (2010). A preliminary account of Xylaria in the Tucuman Province, Argentina, with a key to the known species from the Northern Provinces. 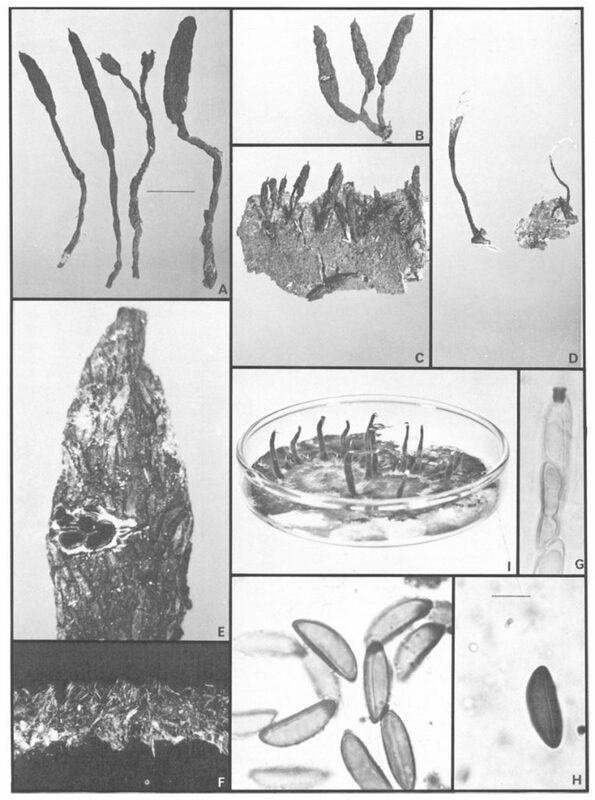 Fungal Diversity, 42(1), 79-96. Rogers, J. D., & Samuels, G. J. (1986). Ascomycetes of New Zealand 8. Xylaria. New Zealand Journal of Botany, 24(4), 615-650. Rogers, J. D., & Ju, Y. M. (2012). The Xylariaceae of the Hawaiian Islands. North American Fungi, 7, 1-35. Awesomely comprehensive post! Thanks, Roo!